A 5 bedroom 4 bathroom villa with infinity pool, this amazing Villa, with spectacular views of the sea, Las Salinas beach and salt flats, the villa is Located 5 min from Las Salinas and Es Cavellet beaches, 10 minutes from Ibiza Town and 5 minutes from the airport. 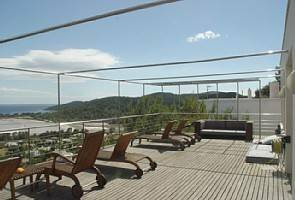 The villa is set on three floors with decking and a pool area over the cliff face itself. This beautiful modern house is a perfect base for Ibiza Town and all it has to offer. With five large bedrooms, all uniquely decorated the villa sleeps 10 people. Each bedroom has its own bathroom, three of which are en suite. It is also extremely private and not overlooked. The large living and dining area has a flat screen TV, DVD and that all-important Sky TV and the kitchen is highly designed with microwave, oven and washing machine. This lounge leads onto a large decked area, above the pool, with teak furniture and chill out zones. The house is also air-conditioned throughout to keep you cool in the height of an Ibiza summer.